Mission Statement The Giving Angels is a non-profit organization dedicated to making a positive impact on the low-income, independent-living senior community of the Verde Valley in Northern Arizona. 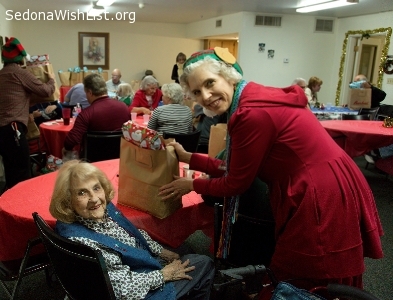 We do this by distributing gift bags filled with hygiene and personal care items intended to provide comfort and improve health of underprivileged seniors. We openly share our model for other communities to adopt. 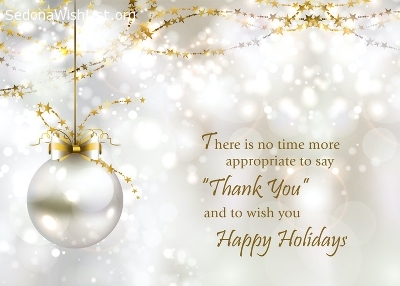 Services and Projects We ensure that seniors are remembered with gifts and personal communication during the holidays. 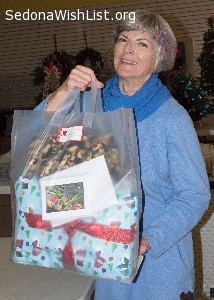 Our volunteers collect donated gifts, sort, wrap and deliver gift bags to the elderly in mid-December. 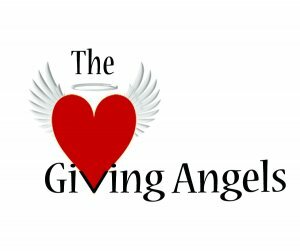 The Giving Angels is seeking new members to add to the core group of volunteers. 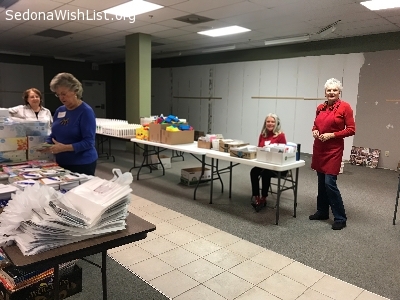 These are the individuals that assist in setting up the volunteer schedules, lead or assist the scheduling for drop off times and locations for the gift deliveries, assist in shopping for gifts and setting up the floor space for assembling the bags, social media postings, etc. There is a small core group now, but a few more people would make the work that needs to get done easier and even more fun. And this is something where you’re giving a little bit of your time for a short 2 to 3 month period out of the year. Many of us don’t even think about having to regulate our lives like that. Unfortunately, many of our recipients do. If you want to learn how you can help, please contact us. The Giving Angels is in need of a Donation Box Angel who would be the lead on coordinating the distribution of our Donation Boxes to the various Drop Off locations, coordinate the weekly (or more frequent if needed) pick up of donated items to be delivered to our office and coordinate the final pickup of all the boxes to be kept and stored for use next year. You will have the help of other volunteers to make it all gets done. We’re gearing up for another wonderful season of Goving. Currently, we are looking for this years set of trusty volunteers. The dates are December 10-14 and time blocks are 10am-12pm and 1pm-3pm. The activities consist of sorting, wrapping, filling bags, sorting recycling, deliveries, clean up, pick-up and delivery of tables. If you’re able, we’d love to have you. Just get in contact with us by email through the website or give us a call. A Huge Thank You to Everyone who has been able to give their time to help The Giving Angels make deliveries this year. We love being of service to our Senior community and couldn’t do it without you. Looking for someone (or a few people) who can loan our organization a few of the 6’ Long sturdy folding tables. We are using them to assist in the sorting and wrapping of gifts for our seniors at our location in the Village of Oak Creek Outlet Mall. We need 12 of them as soon as possible and would use them until December 14th which is our big delivery day. If you do have a table(s) that you can loan, please email info@givingangelsofaz.com or call 928-254-3930. A tremendous amount of gratitude and many Thanks to all the people who were able to put aside a couple of hours in their day to come out and help The Giving Angels prepare 600 Gift Bags for seniors in the Verde Valley Community. Each year, we do have anxious moments of wondering will it all come together, but there are always so many wonderful people here that feel this cause is worthwhile and lend a helping hand. Please help us honor our seniors again this year with a donation to allow us to buy towel sets, toiletries, laundry soap and other sundries these seniors cannot afford. We invite you to donate in one of several ways: You can donate through Paypal on our website at www.givingangelsofAZ.com; You can send a donation to P.O. Box 3118, Sedona, AZ 86340. Our seniors have asked for notecards and stamps for the gift bags. Notecards should be new and have envelopes; no need for full sets. Stamps should be $.49 or Forever. We also need new, unused Christmas and holiday cards with envelopes. Call us at 928-254-3930 or email info@givingangelsofAZ.com. Donations of full-size lotion (unscented), shampoo/conditioner, game books and playing cards, notecards and stamps, hand soap, dish soap (unscented), kitchen towels, dishcloths, pot holders, oven mitts, 2018 calendars, small stuffed animals. The Giving Angels donation boxes will be out during November at these locations: Sedona - Cosse & Wallace CPAs, Curves, Oak Creek Hair Salon, Sedona Knit Wits, Sedona Fit, Church of the Red Rocks, Poco Diablo Resort; Cottonwood - Metro Hair, Quilters Quarter, Yavapai County Government Annex; VOC - Colours Salon, Chase Bank, Weber's IGA, Red Rock Taxes.